I often get asked this question. I recommend disruptive companies that upend entire industries and invent the future. In this article, I want to show you five charts that will help you understand the driving forces behind disruption. The world’s second-largest publicly traded company Apple (AAPL) was founded in 1976. It took 23 years for it to reach a $10 billion valuation. Electronic cigarette company JUUL Labs just achieved a $10 billion valuation in seven months, according to venture capital database PitchBook. 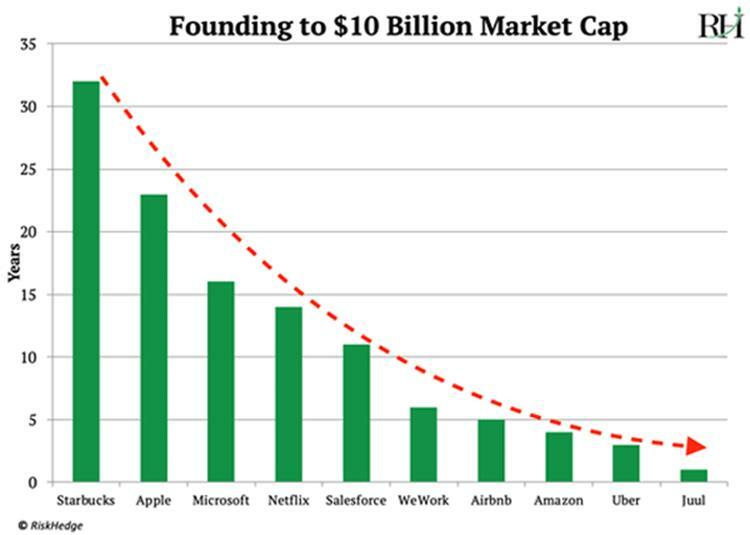 As you can see in this chart, companies are hitting the $10 billion mark faster than ever. Takeaway for Disruption Investors: Today’s truly disruptive companies are building their fortunes faster than ever before. That means their investors are getting rich faster than ever. Since 2000, half of all Fortune 500 companies have either gone bankrupt or been acquired. They ceased to exist in less than two decades. 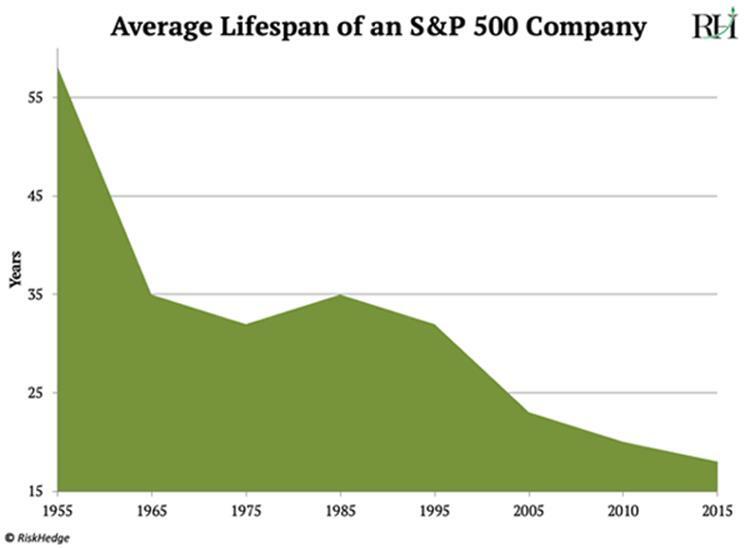 Over the past six decades, the average lifespan of an S&P 500 company has plunged from 58 years to 18 years. Takeaway for Disruption Investors: Businesses are being disrupted at a faster pace than at any time in recent history. That’s why it’s so important you be on the winning side of disruption. Scientists have long known that our DNA holds the key to our health. The problem was that accessing the secrets within our DNA has been prohibitively expensive. It took scientists 13 years and $3 billion to complete the Human Genome Project. Just 17 years ago, getting your personal DNA mapped would have set you back $100 million. But this is all changing. 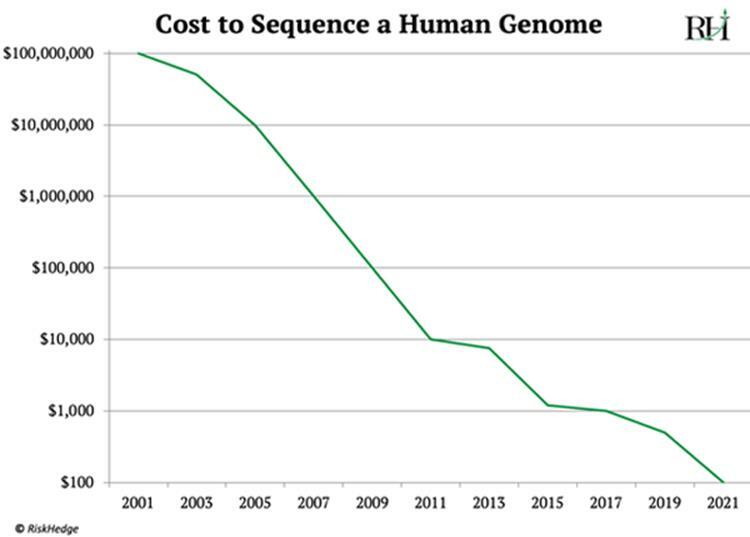 Today, in 2019, it costs about $1,000 to map a human’s DNA. And according to leading maker of DNA mapping machines Illumina (ILMN), within a few years it will cost only $100. That’s one-millionth of what it cost in 2001. This will be a game changer in the healthcare industry. Takeaway for Disruption Investors: Truly disruptive companies are pervasive across all industries, not just technology. Auto companies like Ford (F) and General Motors (GM) have a special place in American history. But I’m predicting the rise of self-driving cars will gut the auto industry like a fish. In December 2018, a company called Waymo launched a fully operational self-driving rideshare service to the public. Waymo is a subsidiary of Alphabet, formerly known as Google (GOOG). Waymo’s driverless fleet has already covered 11 million miles and continues to amass 1 million miles per month today. This is critical because its cars learn from every mile driven. The company has been testing driverless cars since 2009. As you can see in the chart, its progress has gone parabolic in the past year. Also note that Waymo is absolutely dominating its rivals. 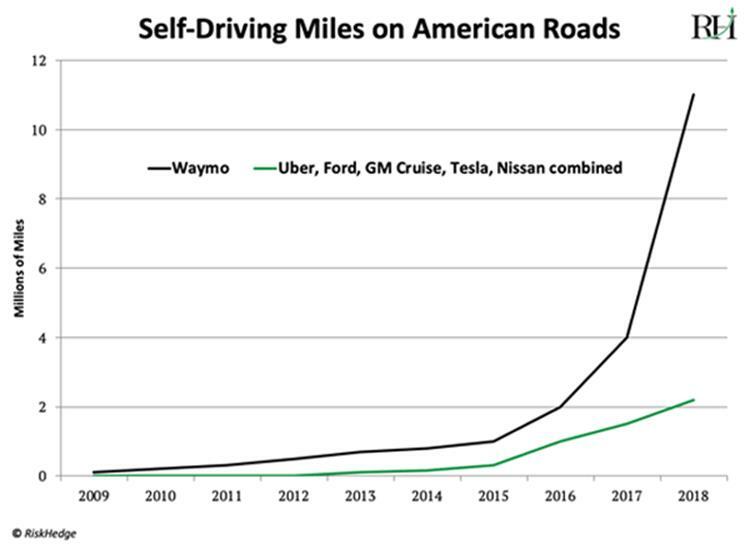 Uber, Ford, GM, Tesla, and Nissan’s self-driving programs have only driven about two million miles combined—less than 1/5th of Waymo’s 10 million+. Takeaway for Disruption Investors: Even age-old industries like autos are now being disrupted by nimble start-ups. And many of the next-generation disruptive trends like self-driving cars, genomics, and advanced computer chips are closer than you think. In 2017, for the first time in history, companies spent more on digital advertising than on TV advertising, according to IPG Mediabrands. 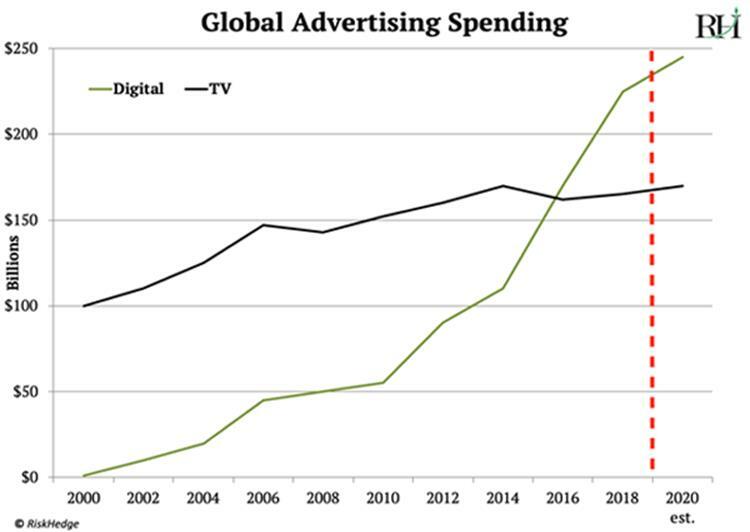 Take a look at the rise of digital ads on this chart. The American internet ad industry alone now rakes in $90 billion a year… as much as the global toy industry. This trend has helped Google (GOOG) and Facebook (FB) to grow into two of the world’s six largest publicly traded companies. They earn almost all their revenue from ads: 98% of Facebook’s revenue and 87% of Google’s comes from selling online ads. Takeaway for Disruption Investors: As old mediums of entertainment like TV become obsolete, pay close attention to where companies are shifting their spending. If you looking for stocks coiled for big gains, grab my recent special report The Great Disruptors: 3 Breakthrough Stocks Set to Double Your Money. In it, you’ll find in-depth research and exact stock tickers along with our buy prices and target prices—so you can invest confidently today. These stocks will hand you 100% gains as they disrupt whole industries. Claim your free copy here. © 2019 Copyright Stephen McBride - All Rights Reserved Disclaimer: The above is a matter of opinion provided for general information purposes only and is not intended as investment advice. Information and analysis above are derived from sources and utilising methods believed to be reliable, but we cannot accept responsibility for any losses you may incur as a result of this analysis. Individuals should consult with their personal financial advisors.